Jack Cork is ready for a big push in February, one big enough to ensure that the Clarets won’t be rubbing shoulders with the bottom three in the Premier League. 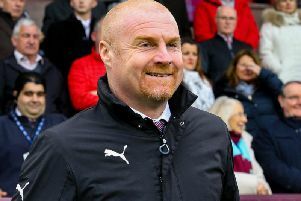 The Clarets started the month with a 1-1 draw at home to Southampton – extending their unbeaten run in the top flight to six games – and fixtures against their neighbours in the division are coming thick and fast. Sean Dyche’s side travel south tomorrow to take on Brighton and Hove Albion at the Amex Stadium. With just three points separating the pair, Cork is determined to drag their rivals in to the mire. “We’ve got 13 games left and it’s a great point really, it keeps us above Cardiff. It’s not easy when you’re chasing at the bottom of the table. “We’ve just got to push on and draw other teams like Brighton in, maybe Bournemouth, and try to involve as many teams who are in and around us. “We have to dig in, make this a big month for us and get as many points on the board before the last five/six games of the season which look tough. The 29-year-old midfielder identified the 5-1 thumping against Everton on Boxing Day as the turning point in their season. The reaction has been similar to that three seasons ago when a 3-0 reversal against Hull City engineered a 23-game sequence without defeat that resulted in the Championship title. Now, having rejoined the pack after being in danger of tailing off at one point, Cork wants to keep the run going to stay out of trouble. “It just sort of feels like we got a big kick from Everton when we lost 5-1,” he said. “I think that was just the bit where we went ‘look, we need to just go back to basics, do everything we can, work as hard as we can, stay together’. “To be fair, even though the results hadn’t been great, the fans at home have been spot on. “We weren’t doing very well in the first half of the season and I feel like that they got behind us, and I feel like the team has sort of realised that we were close to being in a position where we were really far off it. The transformation has coincided with Tom Heaton’s return to the starting XI. Cork believes the skipper, who has registered a couple of clean sheets on his return and made a number of key interventions, has set an example for the rest of the squad. “When I first signed here, Heats was sort of like the main player at Burnley,” he said. “I think he was sort of the one that everyone looked at and thought ‘he’s probably one of the best players’. “He was so unlucky to have that injury where he hurt his shoulder. “Popey came in and did fantastic and was great as well, then Harty was great and now Heats. “We’ve got three good goalies, we’ve got great goalkeepers, and Heats has come in and hasn’t put a foot wrong, really.